If you had suggested yesterday morning that it would be a good day, I would have laughed in your face (or perhaps something ruder). No wind, no motor and no autopilot. Fortunately, the motor problem solved itself. And with some very good advice from Jean-Francois from Boreal, a little Locktite on the o-ring of the pipe exiting the oil reservoir, and some humming and hawing and scratching of our heads…Bingo! the autopilot was also back in business. In the downtime, Seb and Emma also hooked up our trusted Windpilot (an automatic pilot that steers using wind direction) so we now have a back-up as well. Whew! And the other news…? Whoooopie!!! We are past the halfway point. For such a momentous occasion there are a few traditions to follow. The cabin was decorated to look like a seascape with various sea creatures (some more comical, some more realistic) and strands of seaweed hanging from the ceiling. Neptune’s fishy henchman also hid a couple of halfway surprises. 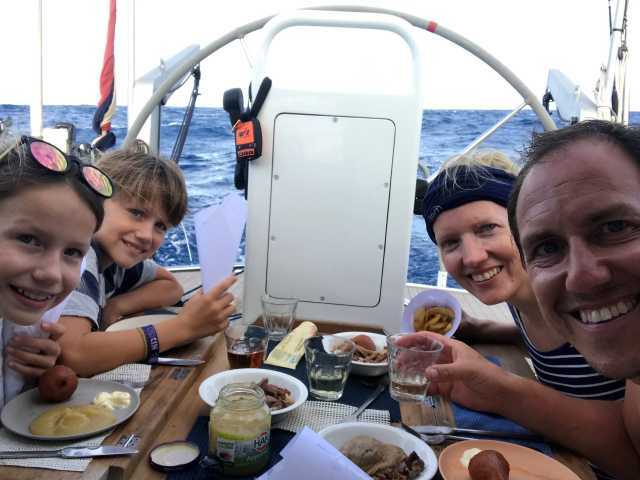 Once the boat was prepared we settled into a special halfway meal of stewed duck, stoofperen, French fries in paper cones with lots of mayo, chocolate cake a la Emma all accompanied by a bottle of fine champagne (and kinder champers for the monkies). Delicious and super fun. Finally, we poured libations (from both champagne bottles) overboard in thanks to Neptune for our safe passage. To top it all off, the wind is back and we sailed at >7 knots all night. Whew! What a relief! David and I will have a celebratory glass of wine and toast to smooth sailing and happy times for the rest of your voyage!